Talk of aurora is in the air. Our earlier story today by Elizabeth Howell alerted you to the possibility of northern lights. Well, it’s showtime! As of 9:30 p.m. Central Daylight Time, the aurora has been active low in the northern sky. From Duluth, Minn. U.S., a classic green arc low in the northern sky competed with the light of the rising gibbous moon. Once my eyes were dark-adapted, faint parallel rays stood streaked the sky above the arc. NOAA space weather forecasters expect this storm to peak between 1 a.m. CDT and sunrise Friday morning September 12 at a G2 or moderate level. Skywatchers across the northern tier of states and southern Canada should see activity across the northern sky. Moonlight will compromise the show, but it rises later each night and dims through the weekend. This is only the start. Things really kick into gear Friday night and Saturday morning when a G3 strong geomagnetic storm is expected from the more direct blast sent our way by the September 10 X1.6 flare. Auroras might be visible as far south as Illinois and Kansas. * Ovation oval – shows the approximate extent of the auroral oval that looks like a cap centered on Earth’s geomagnetic pole. During storms, the oval extends south into the northern U.S. and farther. * Kp index – indicator of magnetic activity high overhead and updated every three hours. A Kp index of “5” means the onset of a minor storm; a Kp of “6”, a moderate storm. * Advanced Composition Explorer (ACE) satellite plots – The magnetic field direction of the arriving wind from the sun. The topmost graph, plotting Bz, is your friend. When the curve drops into the negative zone that’s good! A prolonged stay at -10 or lower increases the chance of seeing the aurora. Negative numbers indicate a south-pointing magnetic field, which has a greater chance of linking into Earth’s northward-pointing field and wriggling its way past our magnetic defenses and sparking auroras. What a crazy sunspot cycle. Weeks go by with only a few tiny spots freckling the sun, then all at once a monster group big enough to swallow 10 Earths rounds the eastern limb and we’re back in business. I’m happy to report we’ve got another behemoth snapping and crackling with M-class (moderately strong) flares – Active Region 1967, a hunk-a-hunk of burnin’ funk that rounded the solar limb a week ago. NOAA weather forecasters predict an 80% chance of continued M-flares and a 50% chance over the next 3 days for considerably more powerful X-class flares. This sunspot group has a delta classification magnetic field, the Facebook equivalent of “It’s complicated”. Sunspots have two parts: a dark core (or cores) called an umbra surrounded by a paler skirt of magnetic energy, the penumbra. They can look impressive like this one, but it’s hard to call a sunspot a “thing”. It’s really more of a locale on the sun’s bright white photosphere where bundles of powerful magnetic energy bob up from below the surface and insulate a region of the sun’s fiery hydrogen gas from the rest of the flaming globe. We’re talking insulate as in staying cool. While the photosphere cooks at around 11,000 degrees Fahrenheit, sunspots are some 3,000 degrees cooler. That’s why they appear dark to the eye. If you could rip them away from the sun and see them alone against the sky, they’d be too bright to look at safely. A delta-class spot group has umbrae of both polarities, north and south, corralled within the penumbra. Like bringing opposite poles of a two magnets so close they snap together, something similar can happen inside delta-class groups. Only instead of a snap, a titanic thermonuclear explosion called a flare goes kaboom.The biggest flares release the equivalent of a billion hydrogen bombs. We thank our lucky stars for Earth’s iron heart, which generates our protective magnetic shield, and the 93 million miles that separate us from the sun. AR 1967 has paraded right in front of our noses as it rotated with the sun. Yesterday it squarely faced the Earth – a good thing when it comes to the particle blasts that fire up the northern lights. Let’s hope it showers us with a magnetic goodness in the coming days. I really miss seeing the aurora. You too? NOAA space weather forecasters are calling for a 25% chance of auroras in Arctic latitudes overnight Feb. 4-5. We at mid-latitudes will try to be patient. Do you feel like you’re in the firing gallery? These sunspots are practically square-on to Earth right now. Although they haven’t shown much sign of erupting, if they did our planet would be right in the line of fire if a flare or stream of solar particles erupted. These groups (known as 1785 and 1787) are so big that they are easily visible in amateur telescopes. 1785 alone is more than 11 Earth-diameters across, according to SpaceWeather.com! Just make sure you have the proper solar filters in place before you gaze at these dark smudges. At times, these regions can get so intense that the energy builds up and releases in the form of a flare and/or a coronal mass ejection — a burst of gas and magnetism that hurls solar material away from the sun. If these flares hit the area of the Earth, a bunch of things can happen. Particles can flow along Earth’s magnetic lines and lead to the creation of aurora, or Northern/Southern lights. (Here’s an aurora that happened in June.) More severe storms can short out satellites or disable power lines. The question has more pertinence given that 2013 is supposed to be the peak of the current 11-year sunspot cycle, but so far it’s been quieter than astronomers expected. Scientists are still trying to figure out how the cycle works. We’ll keep our eyes peeled and let you know if something interesting happens. In the meantime, these pictures came from Universe Today readers, and we’d love to see your images, too! Feel free to add your snapshots to our Flickr page. Update, 2:39 EDT: Among the pictures in our Flickr pool is this new stunner below from Ron Cottrell of Oro Valley, Arizona. “These sunspots are so magnificent that I get striking detail with my small 40mm Hydrogen-alpha telescope,” he wrote us. Update, 2:50 p.m. EDT: On Twitter, Daniel Fischer pointed out that the sunspot group is even visible using a simple camera and eclipse glasses. Last night, as Commander Hadfield and the Expedition 35 crew were returning to Earth in their Soyuz spacecraft, the Sun unleashed yet another X-class flare from active region 1748, the third and most powerful eruption yet from the sunspot region in the past 24 hours — in fact, at a level of X3.2, it was the most intense flare observed all year. And with this dynamic sunspot region just now coming around the Sun’s limb and into view, we can likely expect much more of this sort of activity… along with a steadily increasing chance of an Earth-directed CME. 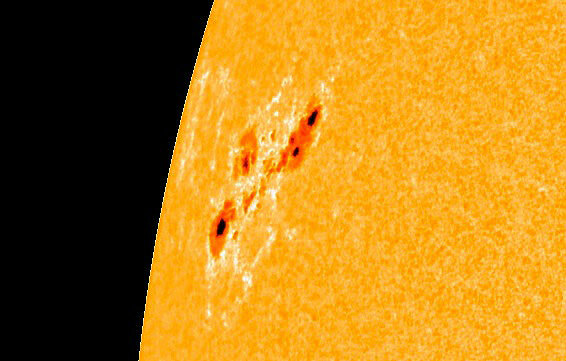 The sunspot region just became fully visible to Earth during the early hours of May 13 (UT). Sunspots are regions where the Sun’s internal magnetic fields rise up through its surface layers, preventing convection from taking place and creating cooler, optically darker areas. They often occur in pairs or clusters, with individual spots corresponding to the opposite polar ends of magnetic lines. Sunspots may appear dark because they are relatively cooler than the surrounding area on the Sun’s photosphere, but in ultraviolet and x-ray wavelengths they are brilliantly white-hot. 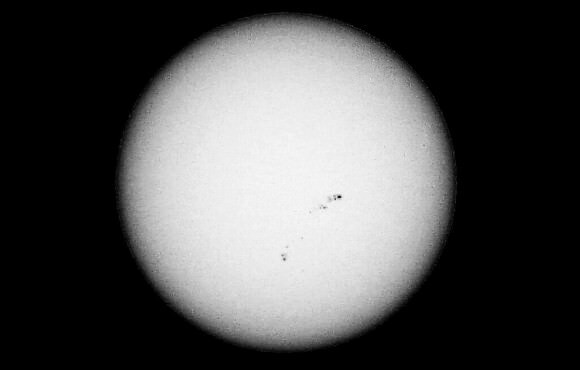 And although sunspots look small compared to the Sun, they are often many times larger than Earth. Read more: How Big Are Sunspots? According to SDO project scientists Dean Pesnell on the SDO is Go! blog, AR1748 is not only rapidly unleashing flares but also changing shape. 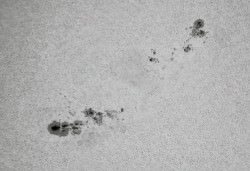 “The movies show that the sunspot is changing, the two small groups on the right merging and the elongated spot on the lower left expanding out to join them,” Pesnell wrote earlier today. Of course, as a solar scientist Pesnell is likely much more excited about the chance to observe further high-intensity activity than he is concerned about any dramatically negative impacts of a solar storm here on Earth, which, although possible, are still statistically unlikely. “Great times ahead for this active region!” he added enthusiastically. For updated information on AR1748’s activity visit SpaceWeather.com and NASA’s SDO site, and also check out TheSunToday.org run by solar physicist C. Alex Young, Ph.D. Images courtesy of NASA/SDO and the AIA, EVE, and HMI science teams. 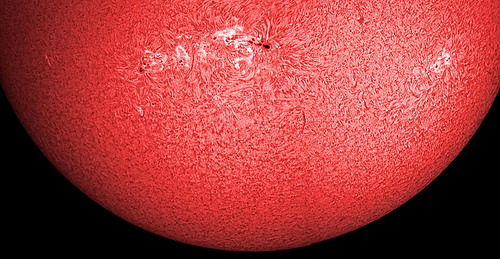 Like an enormous cannon that is slowly turning its barrel toward us, the latest giant sunspot region AR1654 is steadily moving into position to face Earth, loaded with plenty of magnetic energy to create M-class flares — moderate-sized outbursts of solar energy that have the potential to cause brief radio blackouts on Earth and, at the very least, spark bright aurorae around the upper latitudes. The image above, captured by NASA’s Solar Dynamics Observatory earlier today, shows the structure of AR1654 upon the Sun’s photosphere — its light-emitting “surface” layer. Stretching many tens of thousands of miles, this magnetic solar blemish easily dwarfs our entire planet. And it’s not just a prediction that this sunspot will unleash a flare — it already has. Peaking at 9:11 UTC, this M1-class flare won’t have much more effect on Earth than perhaps some radio and GPS interference and maybe increased auroral activity. But AR1654 is still evolving and growing… and moving to face us. In the meantime, solar astronomers and observatories like SDO are keeping an ever-watchful eye on this magnetic monster. Keep up with the latest news here on Universe Today, on the SDO mission site and on spaceweather.com. UPDATE 1/12: According to the NOAA, AR1654 has a 5% chance of producing an X-class flare, based on its current magnetic activity and alignment. A sunspot is a magnetically active region on the sun that appears dark because it’s relatively cooler than the surrounding area—6,000ºF (3,300ºC) versus 10,000ºF (5,500º C). Sunspots are where solar flares are most likely to occur since the magnetic fields in these active regions can build up enough energy to break, releasing bursts of intense radiation into the solar system. Actually, the effects from the incoming CME aren’t expected to be anything particularly dramatic. NOAA is predicting a geomagnetic storm level raging from G2 to G4, which although ranges from “moderate” to “severe” a G2 (Kp = 6) is most likely, according to Dr. C. Alex Young from NASA’s Goddard Space Flight Center. “A G2 level storm can cause some power fluctuations that may set off some voltage alarms for power companies,” Dr. Young told Universe Today. “Damage to transformers is possible for longer events, but unlikely. Satellite companies may have to make some orbit corrections for their satellites, and at higher latitudes where there are aurora they can be some disruption of high frequency radio broadcasts. “All in all the effects should be minor,” he concluded. And this may not be the last we hear from 1520, either. Below is a computer model of the CME from Goddard Space Weather Center. Impact with Earth is expected on 7/14 at 10:20 UT (+-7 hrs), 6:20 am EDT. Auroras may be visible at lower latitudes this weekend, so check the NOAA’s updated auroral oval map to see if visibility extends into your area over the next several nights. Hopefully aurora photographers around the world will be able to get some great photos of a summer sky show! 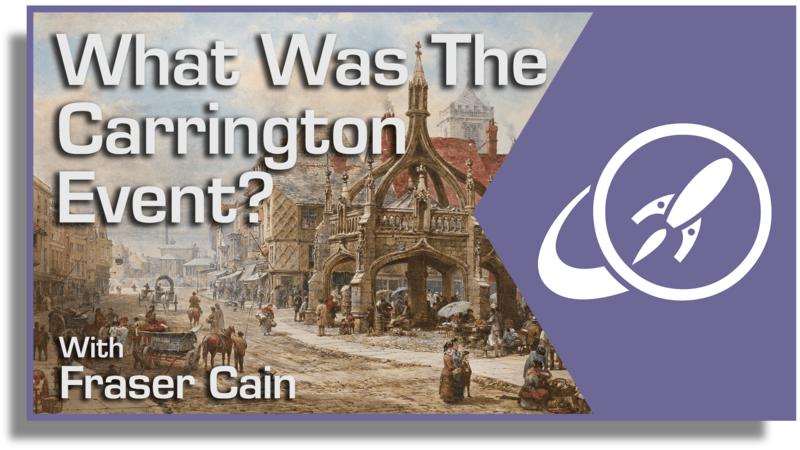 You can keep up with the latest news on solar activity on Dr. Young’s blog, The Sun Today. And of course, stay tuned to Universe Today for more updates on any noteworthy space weather! The video below uses SDO AIA footage in 131(teal), 171(gold) and 335 (blue) angstrom wavelengths, and shows the X1.4 class flare erupted from the center of the sun on July 12, 2012 at 12:52 PM EDT. Each wavelength shows different temperature plasma in the sun’s atmosphere. 171 shows 600,000 Kelvin plasma, 335 shows 2.5 million Kelvin plasma, and 131 shows 10 million Kelvin plasma. The final shot is a composite of 171 and 335 angstrom footage. Top image: illustration of a CME about to impact Earth’s magnetosphere (NASA). Model animation: NASA/GSFC. Video courtesy NASA/SDO and the AIA science team. UPDATE: The CME took a bit longer to arrive than expected, but impact with Earth’s magnetic field was detected at around 1800 UT (11 a.m. PDT/2 p.m. EDT), activating a geomagnetic storm. According to SpaceWeather.com: At the moment, conditions appear favorable for auroras over high-latitude places such as Canada, Scandinavia, Antarctica and Siberia. It is too early to say whether the storm will intensify and bring auroras to middle latitudes as well.